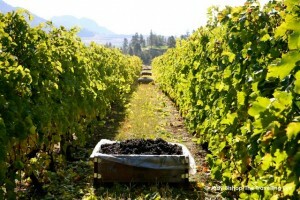 This was shot at Fairview Cellars on Oliver, BC’s Golden Mile Bench, South Okanagan. WineCollective members, we have a task for you. Don’t worry, no homework involved and no wrong answers! All we want you to do is enjoy a bottle of wine, and tell us about it. Let us know what wine you served with your turkey, ham or tofurkey for Thanksgiving. Share your stories on Facebook, Twitter or as a comment on the wine in your WineCollective account. All contributions submitted between October 5th to October 9th will be entered into a draw to receive your November shipment for free. Now that’s something to be thank-ful for! You aren’t a WineCollective member? Sign-up now and you can still be entered to win when you share your Thanksgiving wine-of-choice. Need some help selecting the perfect wine to bring to the in-laws, or what to pour for your guests? Check-out some suggested bottles and basics to turkey pairing from WineCollective. Cheers to SpierHead, winner of best new winery!